I filled my bowl up just under half way with warm water, like I stated earlier, the packet says to use 500ml but I'm not one for following instructions so I just judged it myself. Add about a tablespoon of salt (this is supposedly to make the colour stick to the fabric better) and then sprinkle in some of the dye. Just enough so that the water turns a deep colour, then stir for a good 10 minutes. Once the concoction is mixed and of a rich colour, decide how far up you want the colour to go and simply dip in your shorts up to that point. 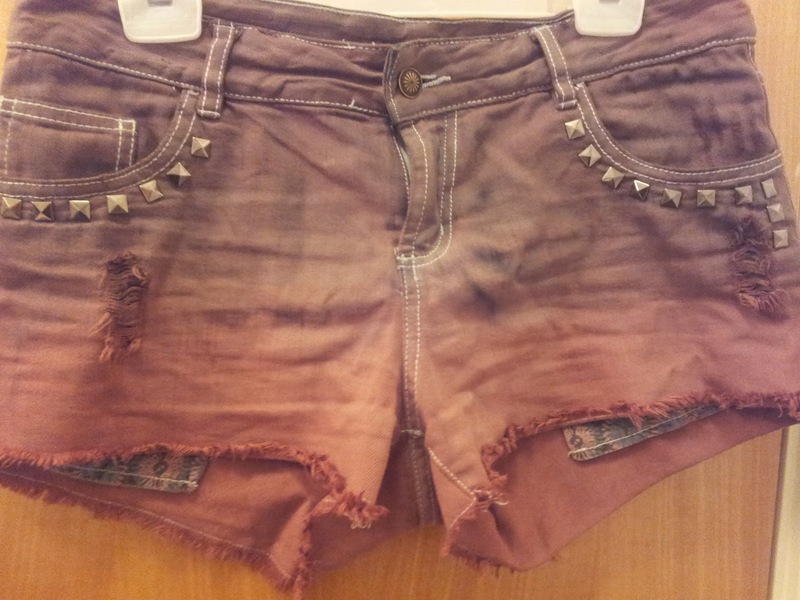 Keep your shorts dipped in the dye for about 20 minutes/half an hour, if you don't want to stand there for that long then somehow lean the shorts over the bowl so that they won't drop in and then you can go about your normal business until they are ready. 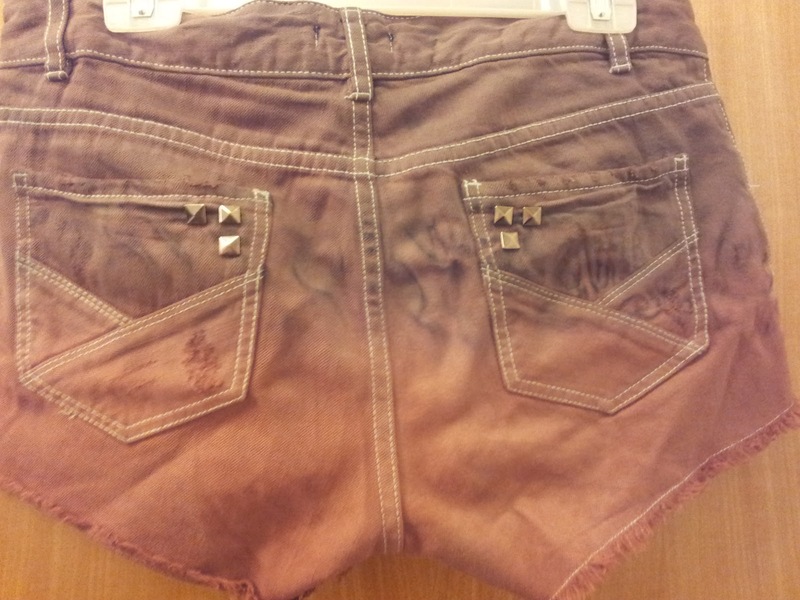 After that time, take out your shorts and rinse with cold water until they water begins to go clear. This took me some time, I would recommend rinsing for about 10 minutes at least. After this, wring them out a bit so they aren't dripping wet. 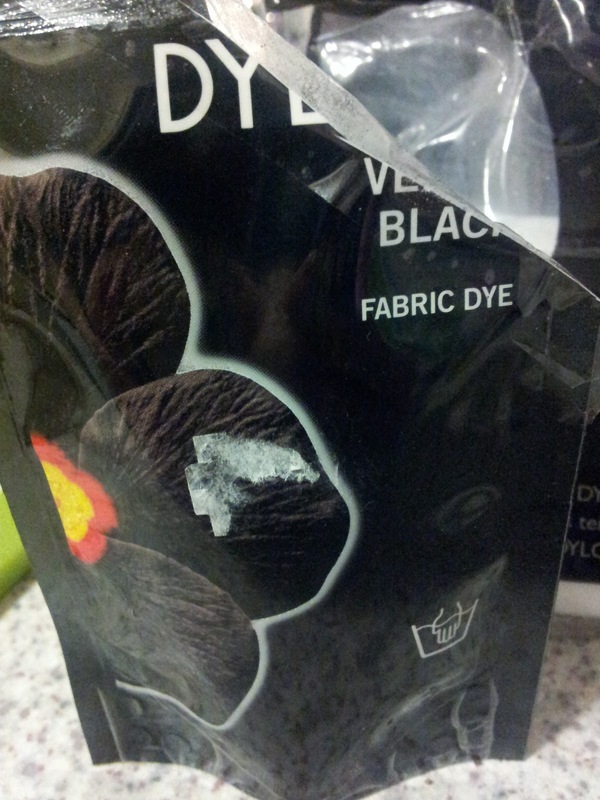 At this point you need to either dispose of the dye you've used or store it in a bottle or tub if you intend to use it again, but I wouldn't personally store it for a long time. 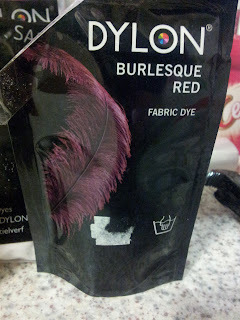 Decide how far you want the colour to go and then dip in your shorts, top first so that the already dyed part is out of the liquid. Again, leave them for a good 20/30 minutes and then repeat the rinsing process. Once this is done, you will need to leave them to dry. I left mine overnight, however be sure to check them from time to time as mine burnt slightly in some places. I found that it added to the effect of my shorts but this might not be the look you desire so make sure you keep your eye on them. Bear in mind that the shorts will be slightly brighter when dry so the look you get straight after dying might not necessarily be the end result. 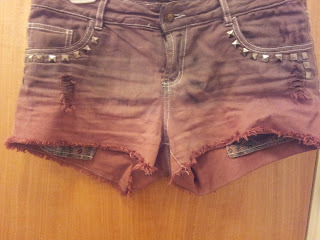 I added these around the pockets and sides of the front of the shorts and put 3 on the back pockets too. You simply just push the spikes of the stud through the desired spot and fold over the spikes at the back to add them to your shorts. 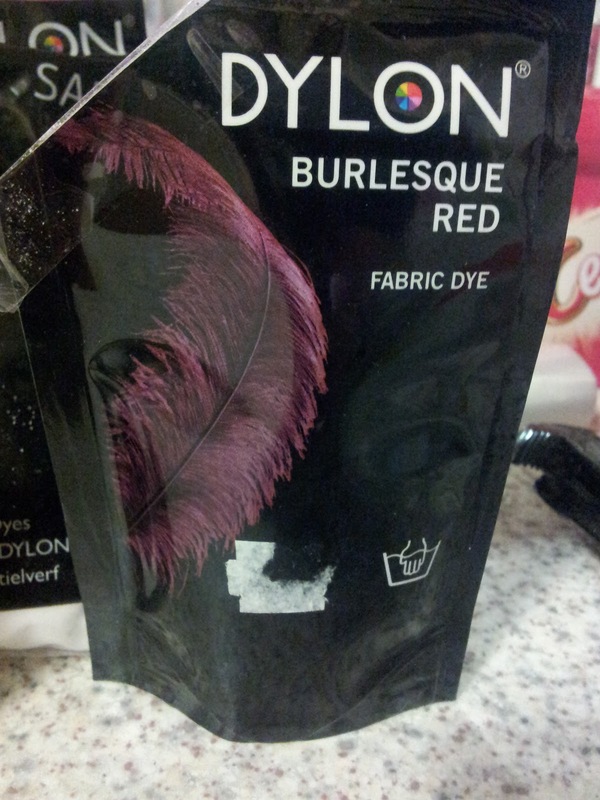 I would advise hand washing, at least for the first few washes, to be sure that the colours don't run. 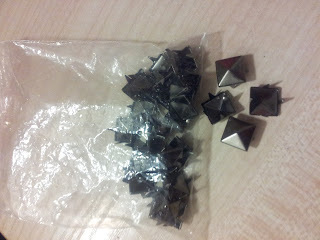 Studs also tend to be quite temperamental in the wash to so its better to just wash them in the sink anyway. 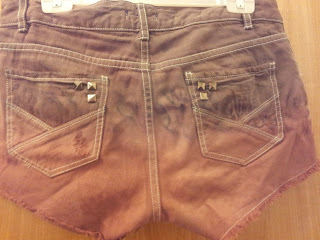 But there you have it, your own customised shorts. These babies are going like wildfire on Ebay at the minute, along with other DIY items, so bear that in mind if you have the equipment lying about and are in need of a few extra pennies coming up to Christmas!